Living in the North Carolina Mountain town of Candler offers plenty of opportunity for adventure. Whitewater rafting, hiking, climbing, and horseback riding are just a few of the things that draw adventure seekers to Candler. Unfortunately, even the most experienced outdoor enthusiasts can find themselves with injuries that need immediate care. When a morning hike turns into a sprained ankle, or when an afternoon horseback riding trip turns into an injured knee, FastMed Urgent Care in Candler, NC is there to help every day of the year. There was a time when you had only 2 choices for medical care – planning a primary care physician’s appointment or a crowded hospital ER. FastMed is a leader in offering medical care that is prompt, personal, and available when you need it. One of the things that makes FastMed Urgent Care so special is our extended hours on most of our locations. So, whether injury or illness strikes late in the afternoon, early in the morning, or on a weekend or holiday, FastMed is able to assist you with no appointment required. 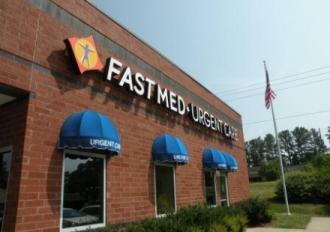 FastMed Urgent Care has several locations throughout North Carolina and Arizona. Our urgent care clinic in Candler is conveniently located at 511 Smokey Park Highway. Treatment for strains, sprains, and broken bones. Treatment for a wide range of illnesses including asthma, bronchitis, influenza, pneumonia, and viral and bacterial infections. FastMed Urgent Care accepts most forms of insurance, most major credit cards, and offers discount programs for self-pay patients. To see an official list of accepted insurances, check out the insurance tab of our website. The FastMed Urgent Care mission is to serve our communities and patients with a high level of quality, personal care, affordable and convenient urgent care, family practice, and other specialty medicine services. Our exceptional and compassionate healthcare providers and staff commit to always be: Caring, Respecting, Accepting, Valuing, Encouraging, and Understanding. Contact us today for more info!